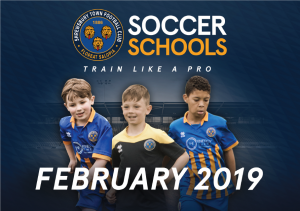 Shrewsbury Town in the Community are delighted to have teamed up with St Johns’s Catholic Primary School to deliver Bridgnorth Soccer Schools during the upcoming February Half Term. Backed by funding from Shropshire Council Community Enablement Fund, participants will have the opportunity to ‘Train Like a Pro’ with Shrewsbury Town in the Community coaches and take part in individual and team challenges to win a variety of prizes! Taking place on Monday 18th & Tuesday 19th February 2019, Booking in advance is essential, as we only have 32 places, available for the fantastic price of £20 for two full days. See more information about our Soccer Schools including full dates and locations here.